Quality quilt or comfy cushion, the Quishion from JML gives you the best of both. 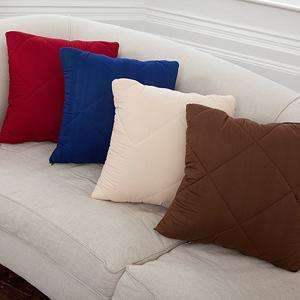 As a cushion, it’s a comfortable, stylish addition to any room – perfect for sofas, chairs and beds. Unzip it and you discover this cushion’s hidden secret; it transforms into a warm and cosy quilt. The Quishion offers you unbeatable convenience and optimum comfort – saving you precious storage space around your home. Available in 4 classic colours, it’s certain to tone in beautifully with any room’s colour scheme. Use around the home, in the car or on holiday and get versatile comfort all zipped up. These have dropped in price dramatically - were originally £29.99!! I have some of these and they are useful. They are 4 tog and are very lightweight. We have them at our holiday chalet and use them at home for extra warmth in the winter, also useful in cars for a long journey and mine went with me on a 24 hour coach journey last year!